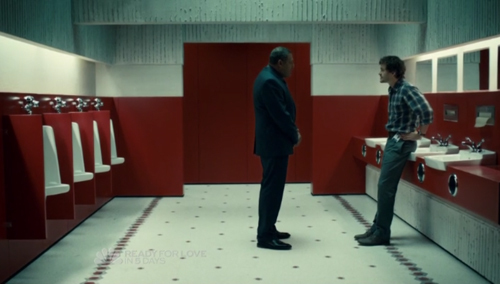 An excellent opener, diligently establishing Will Graham’s state of mind. 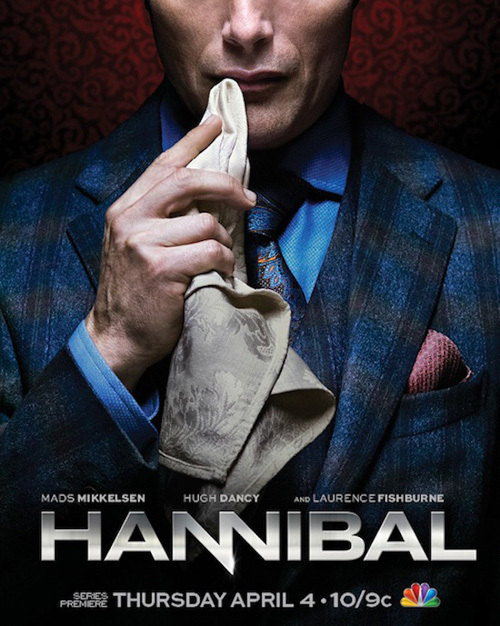 We don’t even see Lecter until 20 minutes in, after Will realises that the killer being hunted is eating his victims. As strong as Hugh Dancy is throughout the run, Graham hasn’t been served quite so well in subsequent installments; writer/creator Bryan Fuller and director David Slade really get to grips with his fragile headspace here. That said, I’m not sure they didn’t make a meal of setting out his behavioural quirks (he’s studiously avoids eye contact, is “closer to aspergers and autistics” on the spectrum but “I can empathise with anybody. It’s less to do with a personality disorder than active imagination”. Well that cleared that up, then. The problem with the killer-of-the-week format is that it encourages the characters to tread water or behave repetitively; the area I’m most not buying with Will later on is that he’s popping in to see Lecter every five minutes. Less is more. It’s an interesting decision not to have Graham married with a child; maybe Fuller was conscious of how Millennium (Season One) copied Red Dragon’s protagonist so closely and he wanted to avoid a similar set up. So stray dogs and Lecter fill the gap. And making Dr. Bloom a woman gives him a potential love interest (nice to see Fuller casting his Wonderfalls lead). I like the “This is my design” he intones whenever he’s in the mind of the killer but, while Slade does sterling work in setting out the visual tone of the series (his feature debut Hard Candyis still his most impressive work), the device for Graham assuming the antagonist’s role through reverse slow-motion becomes old quite quickly. The visuals in Hannibal are as sumptuous as those in Fuller’s Pushing Daisies, and the food preparation is mouth-watering (even if such aesthetics are intended to be undercut by the knowledge of human matter in there). A suitably exciting climax, all the better for having Lecter initiate it. And a plus point that Will spends the rest of the season haunted by the shooting. Having the “canonical” Garret Jacob Hobbs in the first episode is a neat and interesting way to kick things off, suggesting as much fidelity to the source material as possible, but a recurring is that so many plot beats are pre-empting Red Dragon, it makes it surprising they didn’t solve that case in five minutes. I do like the dialogue drop-ins that occur occasionally, though. And the ultra cynical quips of the forensics team make are a nice contrast to the misery of Graham. 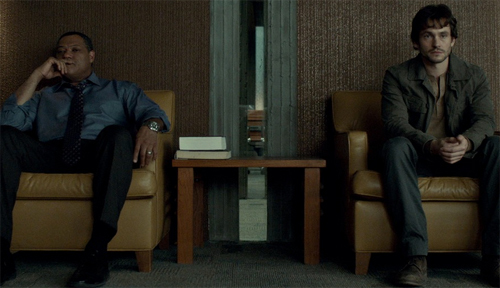 Larry Fishburne is strong as Jack Crawford; I’m not sure who my favourite Crawford is. Probably still Dennis Farina. The sick creativity of the mushroom victims is something to behold, and the one who wakes up is straight out of Seven. Bonus point to the bad taste “Find any shitakes?” from one of the forensic team. Reinventing Freddie Lounds as a hot redhead instantly makes a lot of sense for unscrupulous reporter purposes, particularly when it comes to appealing to Eddie Izzard’s vanity in a later episode. 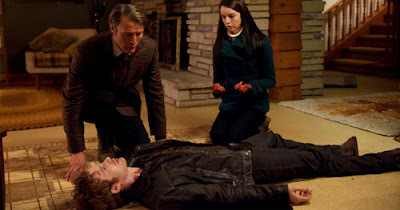 The scene where she visits Lecter is particularly strong, and there writers do a good job instilling a sense of hesitancy about what we think he’ll do in any given situation; sometimes he will stand by, sometimes save a life (or both at the climax of the opener), sometimes make a deal, or even give someone up. I’m not too sure about having Jack over to Lecter’s as a regular dinner guest, and Lecter rehearsing his “God’s terrific” speech (which we’ve seen in both Red Dragon and Manhunter films now) is overkill. Mainly, though, the problem with this one is that it all falls into place too quickly and that the killer’s motives are feebly sub X-Files (the cod-psychology of his kinship to fungi). I had half hoped Jack was right about Abigail Hobbs being an accomplice to her father, as it might have created interesting plot possibilities. 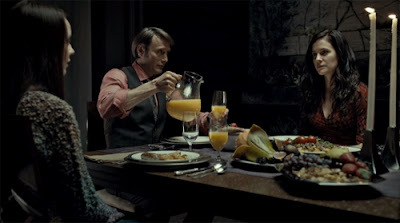 As it is, the first 30 minutes where she is returned home keeps you guessing about her motives and is extremely well-sustained; the best moment is when she suggests reenacting the scene of Lecter’s phone call to her father and looks at him as she says, “… and you be the man on the phone”. And Will’s leaps are similarly effective; having deduced that one of the victims was a copycat, he is now convinced that the perpetrator was the one who called Hobbs. This sort of ongoing plotting is much more effective and involving than attempts to come up with a new psycho with a distinctive manner of eviscerating his victims. This episode’s Red Dragon snippet; “It’s the ugliest thing in the world”. I’m not all together sure about Lecter’s loud suits. Mikkelsen carries them off but surely Lecter would think they’re vulgar? This episode is five star territory until the last ten minutes or so, when the events in the house, with the police still outside, become ludicrous. Abigail gutting the victim’s brother, Lecter knocking out Bloom then somehow clearing up all the mess and removing the body. And before that we have Lecter going for copycat-happy murdering. But it’s an intriguing place to end, with his becoming a mentor-type to Abigail. This was the unbroadcast episode in the US, and it’s fairly so-so. The motivations are rather unlikely (boys killing their real families in order to bond with their “new’ one) and the conclusion is rushed again; just get it all sorted in 40 minutes. All it needs is one quick deductive leap from Will and presto. Also, the “Will has issues” character theme is becoming repetitive rather than more engaging. Still, it’s interesting to see Molly Shannon in a non-comedy part. A bit like Robin Williams, she’s a natural at playing psycho. Another episode that feels run-of-the-mill, just with added grotesquerie in the imagery. This is the one so far that reminds me most of a Millenniumepisode (the religious overtones of the mutilations), with a touch of X-Files in having a killer with a brain tumour subject to visions (seeing potential victims with burning heads). In theory, Jack’s wife (Gina Torres from Firefly) receiving therapy from Lecter is a neat idea, but nothing very interesting is done with it. Nor with the frictions between Jack and Bella (she’s dying, he doesn’t know what to do etc). This week’s Red Dragon snippet; “That smells like something with a ship on the bottle”. And “I can give you the majesty of your becoming” sounds very Tooth Fairy. Again, the killer’s not very interesting, and you’re conscious how much more effective this would be if it could embrace a slightly looser cable TV approach. 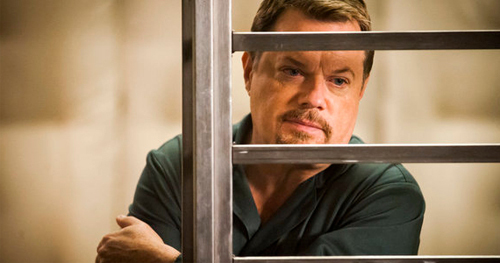 Eddie Izzard has a similar shaped face to Anthony Hopkins, but I expect he was cast as this proto-Lecter (in terms of incarcerated, intelligent serial killers) because Fuller felt guilty about the non pick-up of Mockingbird Lane. Izzard’s actually quite good (but then, I tend to enjoy David Bowie performances, so what do I know?) If Izzard’s a proto-Lecter, then all-grown-up Anna Chlumsky is a proto-Graham. 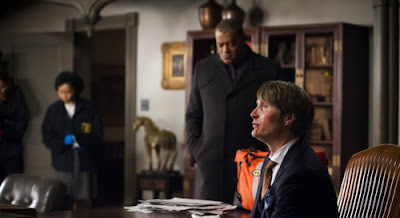 This episode nears five star territory again, but falls down at the last hurdle by lazily going the whole hog of imitation and copying the means by which Graham will eventually learn Lecter’s identity. Here, it was Chlumsky realising that Lecter is the Chesapeake Ripper. I wonder what the thinking is; it doesn’t matter because they aren’t going to go as far as adapting Red Dragon (or rather, how we’re told that Will recognised Lecter in Red Dragon)? Maybe it shouldn’t bother me, but either they want this to be a feasible prequel or they don’t. The thread of Jack being menaced by phone calls from the long dead Chlumsky is especially effective, though, and is very nasty reminder of Lecter as the puppet master since he’s also having Jack round for dinner and tending to his wife etc. Much as I like Anthony Heald’s Chilton in Silence/Red Dragon, Raul Esparza may be even better on the smug/cocky front. The “Nice to have an old friend for dinner” is a bit obvious, though. I’m not so sure about the laissez-faire attitude with which Lecter takes another four victims, safe in the knowledge that they’ll be blamed on an organ harvester, but it’s in all the other elements that this one works so well. 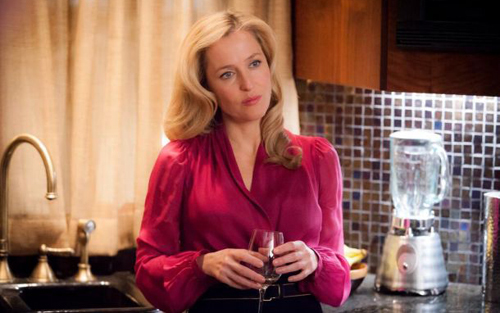 Gillian Anderson is excellent as Lecter’s insightful shrink (“You’re wearing a very well tailored person suit”). Interesting to see Ellen Greene as one of his high society dinner party guests. And Dan Fogler all but steals the spotlight from Mikkelsen as over-familiar patient Franklin. The best episode since the opener, even if the penchant for each successive serial killer staging ever-more icky art instillations out of their victims is becoming silly. Tim Hunter (River’s Edge) directed this one; he seems to have resigned himself to TV gigs over the last two decades. Anderson continues to coolly control Lecter (“I’m your psychiatrist, you’re not mine”) as he tries to pull on any thread available to get a response. But this one is so good because it allows plotlines from previous episodes (Franklin, his now-discovered-to-be-a-psycho-friend Tobias) to come to a head. It’s a great Lecter episode (he plays the theremin? ), as he’s put in harm’s way and doesn’t have an easy time of it before eventual winning out. It’s also a much better Will one, with Bloom nixing his romantic overtures and his realisation that she did so, at least in part, because she knew animal noises coming from the chimney he dismantled were his hallucinations. Their recurrence contributes to Will’s failure to apprehend Tobias, and thus the attack on Lecter. I don’t know if I buy Lecter’s tentative steps towards friendship with Will (“I was worried you were dead”) but Franklin’s idiotic attempts to reason with Tobias, and Lecter putting an end to his patient, kicks off one of the best scenes in the series thus far. I like how MIkkelsen isn’t doing anything that Hopkins does. He’s maybe a bit more like Cox except that he’s not so understated. Mikkelsen is all glacial calm, with no scenery chewing in sight. The main problem ahead will be keeping the show credible as it develops. Graham is inevitably undermined if he remains so close (along with everyone else) to Lecter for so long and doesn’t get a whiff of the truth. Meanwhile serial killer after serial killer comes a-knocking – presumably this is still a universe of the characters that leads up to Red Dragon. Even if the series isn’t cancelled, I don’t think I can hold back disbelief for more than a couple of runs. The show really needs a slow-burn approach to investigating each killer – maybe only having a couple of different cases per 13-episode run to make it plausible. They could have a season of Lecter incarcerated, then skip Red Dragon/Lambs/Hannibal to an older Will reencountering the Doctor; that might be fun.